Confide became popular last year after the crypto-messaging service was being allegedly used by existing White House staffers when President Donald Trump took office. However, political press aside, the app actually is a really good messaging app for people who are extra-concerned about their online privacy. Not only are the messages end-to-end encrypted, they are also ephemeral so they are erased after the recipient reads them. Not only that, the app also provides screenshot protection on devices. That means users cannot take screenshots of messages they have received on Confide. That said, the feature only worked fully on Android, Mac, and PC, and only partially on iOS because of platform restrictions. Not only that, ScreenShield also protects against other forms of screen capture including AirPlay screen mirroring, QuickTime screen recording and iOS 11 screen recording, among others. Confide is also making ScreenShield technology available to third-party developers through its ScreenShieldKit. 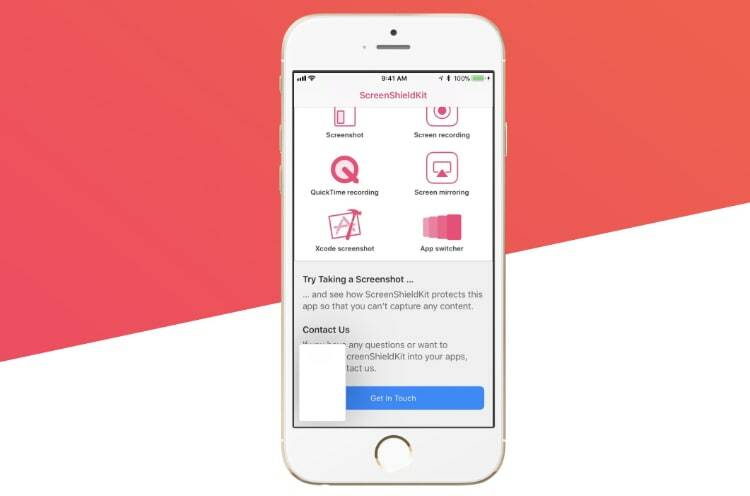 ScreenShieldKit is an SDK which any iOS app developer can include in their apps to make them screenshot-proof just like confide. The best part of the ScreenShot technology is that nothing has to be done on user’s part. Once their app is ScreenShield enabled, it will do all the work to prevent screenshots. You can download the latest version of Confide to see ScreenShield technology in work.